Born: New York, 24 May 1956. Education: Choate School, 1970-74; graduated from Rhode Island School of Design, 1978. Career: Cofounder, Whittall and Javits, Inc., 1978, creating women's hats and later separates and t-shirts; sold out to partner, 1985; founded Eric Javits, Inc., specializing in women's hats and occasionally hair accessories, 1985; licenses included Maximilian Furs, 1991-93, and Kato International, Japan; also designed hats for films, including Bonfire of the Vanities, for television shows, including Dynasty and Dallas, for many advertising campaigns, and runway collections of other designers, including Carolina Herrera, Caroline Roehm, Mary McFadden, Pauline Trigére, Adolfo, Louis Féraud, and Donna Karan. Exhibitions: Mad Hatters, Women's Guild of the New Orleans Opera Association, 1989; Current Trends in Millinery, Fashion Institute of Technology, New York, 1990; The Art of Millinery—20th Century Hat Design, Philadelphia Museum of Art, 1993. Collections: Metropolitan Museum of Art Costume Institute, Fashion Institute of Technology, New York. Awards: "Millie" award, Hat Designer of the Year, 1991, 1992; Martin Birnbaum award for Excellence in Drawing and Painting; National Spanish Examination award, three years in a row at Choate. Member: Millinery Institute of America and Council of Fashion Designers of America. Address: 433 Fifth Avenue, Suite 200, New York, NY 10016, USA. Email: . Berman, Phyllis, "Wearable Art," in Forbes, 19 October 1987. Howard, Tammi, "Eric Javits: Changing the Shape of Millinery," in WWD, 18 March 1988. Hochswender, Woody, "Designers Find Fashionable Ways of Talking through Their Hats," in the New York Times, 14 June 1988. Stevenson, Peter M., "Crown Prince," in Manhattan, Inc. (New York), August 1989. Newman, Jill, "The Many Hats of Eric Javits," WWD, 2 March 1990. Sherman, Jean, "Top Hatter," New York Magazine, 16 September 1991. "Hats are Back," in the Kansas City Star, 4 April 1993. Kramer, Carol, "The Drape of the Locks," in the New York Times, 4July 1993. Carter, Reon, "The Proper Topper," in the Cincinnati Enquirer, 10March 1997. Barrett, Janet, "Eric Javits ('74) Designing Hats That Women Love," in Choate Rosemary Hall Bulletin, Winter/Spring 1999. Wright, Jason Ashley, "Hat Designer Eric Javits to Visit Friday," in Tulsa World, 15 April 1999. Homan, Becky, "Style with Squish: Eric Javits Makes Hats to Flatter and to Fold," in the St. Louis Post-Dispatch, 16 October 1999. Robins, Cynthia, "Sun Screens," in the San Francisco Chronicle, 6May 2001. "Eric Javits, Inc.," available online at the Key West Madhatter, www.kw-madhatter.com , 9 June 2001. My design work is only one aspect of involvement with owning my own hat company, and it remains the only part where I am not relying on the team's abilities but on my own. Whenever an inspiration hits me, I make a note of the idea by sketching a small diagram. This provides a springboard from which many things can later develop. Using this method, I can have the concepts for an entire collection outlined within a few days. Sometime later in the process, when the designs are actually being fabricated, I will consider them from a production and marketing viewpoint. Those issues are quite complex given the varied needs of today's woman, and the ever-changing nature of the fashion business. Many of my ideas are the result of an evolution, synthesizing and reworking bits and pieces of my most effective ideas and occasionally going off to test a completely new direction which, if successful, could eventually become part of the line's core. When a design arrives successfully, most of my developmental energy is not evident. What remains, seemingly, is an object which has its own logic and which appears to have been plucked effortlessly from our collective subconscious. Style-consciousness began in Eric Javits' family in the 1920s, during which his grandmother, artist Lily Javits, made hats for the Shubert Organization and counted actress Mae West among her fans. Of his fascination with his grandmother's paintings, he commented, "I was the only grandchild who was permitted in her studio, because she knew I wouldn't touch anything. Then she saw how interested I was and bought me my own paints. That was when I was about five years old." A versatile, involved student, he directed the literary magazine, managed the campus radio station, sang with the chorus, and played soccer, squash, and tennis. By September 1991, the skill of Eric Javits was touted in New York Magazine , as "quite simply, tops." In an era in which the hat is a style anachronism and a definite statement of individuality, if not idiosyncrasy and exhibitionism, Javits has created hats of distinct and discreet identity, both the designer's and that of the potential wearer. and has concentrated on hats that are not agglomerations and concoctions, but are modest one-statement sculptures for the head. 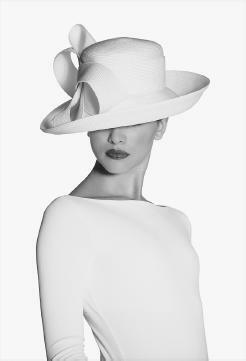 Javits' restraint is his focus on one important statement in each hat, seldom adding secondary elements. Often the interest is, in fact, in the shape and he has searched the past for a wondrous array of traditional shapes to frame the face. Yet, even as shape is of critical importance to Javits, one millinery myth has he, or the archetypal hat designer, whipping a perfect hat out of his pocket—as Javits is said to have done for Carolina Herrera. The legerdemain of the hat in his pocket notwithstanding, Javits plays with a softening of shape so that even his military inspirations and his menswear derivations work as softer versions of the source, though never collapsing into Oldenburg flaccidity. Defending his decision to enter millinery, as he did somewhat serendipitously, Javits describes the early hat-making as a relief from painting and sculpture. "Hatmaking was playful, there was no pressure. A weight was taken off, and it snowballed into something more serious." His play is quite serious, though, a Bauhausian caprice rather than Carmen Miranda theatrics. While some of Javits' hats are for a day at the races, his most important contributions are hats that can serve for day and cocktail hours. He makes one of the most convincing arguments for the possible return of millinery to daily attire in dealing with classic shapes, such as a velour beret or the most refined form of the basic derby. His red tophat with poinsettia photographed on the cover of Town & Country, (New York, December 1990) is Dickensian tradition manifested in a time-honored silhouette, but made fresh with a feminine and flattering red as well as the single note of the white poinsettia adornment. Javits excels in such distilled grace notes, projecting the hat as a deliberate statement for and upon the wearer. Fred Miller Robinson argues for the bowler hat as a salient sign of the modern spirit ( The Man in the Bowler Hat, Chapel Hill, 1993). He points out that it is ever and increasingly filled with the semantics of its origin. What happens in an Eric Javits hat? Customarily, saving most of the over-the-top extravagance for the Louis Féraud line, the Javits hats have the snappy stateliness of a wonderful tradition fittingly renewed. Without succumbing either to arid art or to a conceptual base alone, Javits' fundamentals of hatmaking likewise give the hat its historical function and purpose and offer it as a basic vessel adaptable to modern lives. Few milliners have been as conscientious as Javits in reconfiguring the hat in accordance with its historical templates and modern comforts. Few milliners have taken a modernist sculptural responsibility and talent in honing in one element of the hat to make it converse with the apparel to give presence to the face of its wearer. Into the 21st century, Javits, the grandnephew of the late New York Senator Jacob Javits, earns a place among the creators of beautiful things. Some of his chicery, like the hats with wigs attached, he crafts especially to the tastes of the Big Apple to celebrate women, from the everday impulse shopper at Bergdorf's to Katie Couric, Whitney Houston, Hillary Clinton, and Madeline Albright. In his words, "What career woman cares about price? As long as career women care what they look like, I'm in business." Javits has stayed in demand in a fickle, style-driven market by keeping abreast of what the youngest hat-wearers want and by knowing where and how people display head coverings. Consequently, he has maintained a steady fine-tuning of his classic, elegant, sensible, and fantasy models sold in the millinery salons of Bonwit Teller, Bergdorf Goodman, Saks Fifth Avenue, Bloomingdale's, Macy's, Chicago's Marshall Fields, and specialty shops. In the fall of 2000, LuxuryFinder.com , a top online retailer of luxury goods, touted its selection of Javits hats. Tops in the era were his Stetson in natural python and matching hat and hobo bag in cheetah, giraffe, leopard, and wildcat patterns. Of these whimsical models, he comments, "I like to see women have fun in hats. You wear them for all different reasons, but I think the main thing is that it's another way to express yourself. Marry that with function, and then you really need them."